When the bell rings at Bayswater Waves, children abandon the water slide queue for the pool to ride a session of machine-made 'waves'. 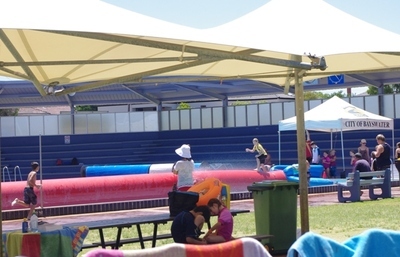 The centre bills itself as 'Perth's premier indoor aquatic playground', with WA's only wave pool, six swimming pools, a water slide and giant inflatable toys. Running along an inflatable toy. Floating 'fun nuts' are available for hire to ride the swells or explore a twisting 'river'. The waves operate for 10 minutes every half an hour or so during school holidays (10am - 4pm weekdays, 10am-6pm weekends' but, at other times, only 'as required'. 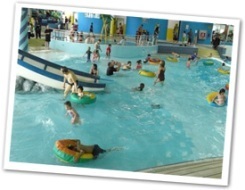 Swells rise to different heights in different parts of the wave pool, allowing for swimmers of all abilities to participate, before gently breaking on the shores of the toddler area. There is a separate baby pool, decorated with faux palm trees, which does not enjoy any wave action. The centre rules note that surf and boogie boards are banned - although, having seen the 'waves', they would be un-rideable in any case. For big kids, a fully-enclosed tube-style water slide cascades down from on high while littlies can enjoy a non-threatening traditional water slide in the form of a 'boat'. 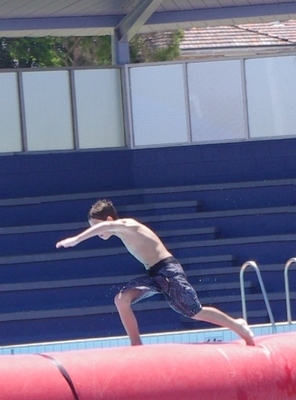 Serious swimmers can head to a 25 metre indoor pool or 50 metre outdoor number. All pools at Bayswater Waves are heated. The centre also offers a spa, sauna, steam room, gymnasium, fitness classes, creche, enclosed outdoor playground, and cafe. 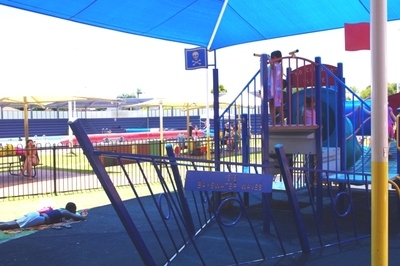 It holds periodic events such as family days and even swim-up movies, as well as birthday parties. 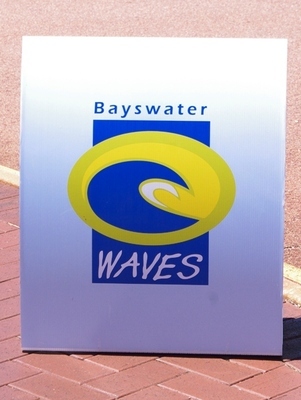 My daughter enjoyed a visit to Bayswater Waves but said she preferred Maylands Waterland. I suspect older children - and parents who can't be bothered with sunscreen - would pump for Bayswater Waves, where much of the action is indoors. Why? Water fun, without the sun. When: Doors open 5.30am-8.30pm weekdays, 7.30am-7.30pm weekends. Not all pools open these hours. Cost: Adult $5.40, child $4.20.